Chicken houses (often called chicken coops) come in a variety of qualities, materials, shapes and sizes and there are many different variants to suit different circumstances. I haven’t ever tried a plastic chicken coop to be honest with you, although they are certainly a popular chicken house with many keepers. Omlet seem to be the leading supplier and they produce a number of different models and accessories. The size of run that the birds get is not that big so you need to consider letting your birds out regularly to free range. If this is difficult, you can easily move most of their coops around. The mesh is sturdy on their runs and there is a flap of mesh around the base that stops predators from getting in but remember the ground must be flat so as not to create a weak point. 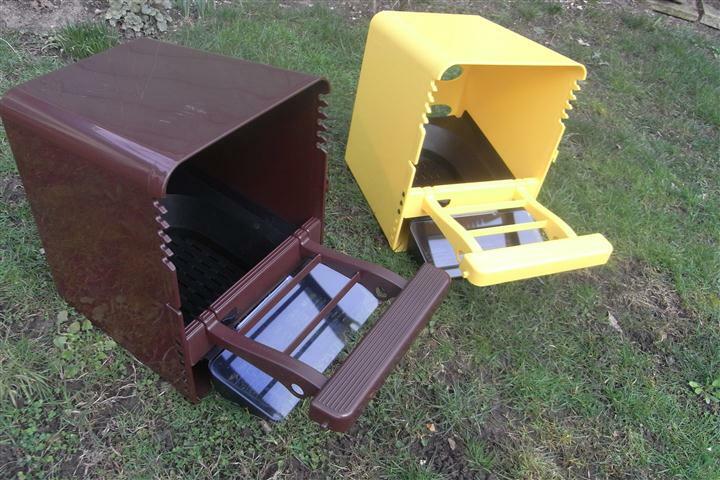 Omlet make a range of different coops and associated accessories such as clip on feeders / drinkers that match the colour of their coops. The biggest advantage of their coops is that it can be cleaned out easily and there are fewer cracks and crevices so it’s harder for red mite to take up residence as they are washed away easily. 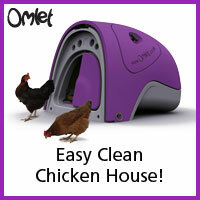 The Omlet website sells a huge range of products for the chicken keeper. Unless you have a very large run, you can end up running out of grass, especially in the winter but with an average sized lawn, and a movable run such as the runs supplied by Omlet, you should be able to provide your hens with fresh grass every week. I have seen some sturdy recycled plastic ‘ECO’ chicken houses being sold that are made from recycled plastic (usually made from recycled farm waste) and in my opinion are a very well designed. The plastic used in chicken houses is normally quite thick and the walls are bolted together securely or moulded in one piece. Houses usually come flat packed so are both practical (for cleaning) and are certainly secure from predators such as foxes and badgers. Plastic houses also allow a large DIY run to be built around them or some come with optional fitted runs that can be extended (e.g. Omlet). Building your own run is of course time consuming but if done properly it can last a very long time and save you a good few hundred pounds. 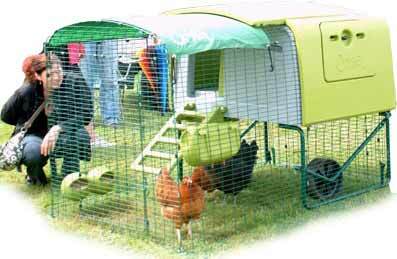 My one small bit of advice when buying a hen house: Always buy one a little bigger than you need! Hen house manufacturers will give you numbers of chickens that can be housed in a coop but you will find the hens usually need a little more space than this. They assume this is roosting space and you have a contented flock that are happy to roost together. Often this isn’t the case and you will find some chickens are at the bottom of the pecking order and don’t get the opportunity to roost. For example, all of the hens want to roost on the one top perch or one hen is being pecked so has to roost with a gap between her and the others or the hens need to stay in their house because of snow or you started with 3 chickens but you’ve been given another 2 by a friend and so on…. it’s so addictive keeping chickens you may want to buy a few more. All of these reasons mean you’ll wish you had a slightly bigger house. 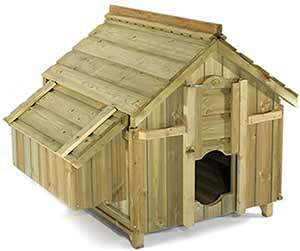 There is a good article on Cheap Chicken Coops on the Poultry Keeper website that looks for chicken houses below £200 that you might find worth reading. Some of the cheapest wooden hen houses are manufactured abroad, like this hen house shown to the right. 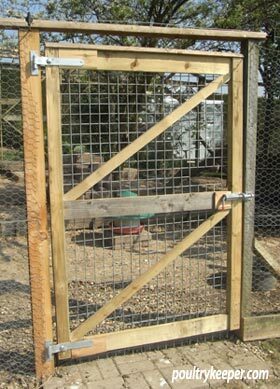 This may be a good choice if you are on a limited budget or would like to ‘dip your toes’ into the World of Chicken keeping. Manufacturers usually give you a guide as to how many chickens a coop will take. This is usually roosting space in an ‘ideal’ world… At the cheaper end of the market, often these figures get exaggerated so use this as a guide for standard (hybrid size) chickens or bantams. Large breeds such as Orpingtons, or Wyandottes should have half as much space again. Floor Space: A minimum of 30 cm x 30cm (90 square cm) per bird floor area. i.e. 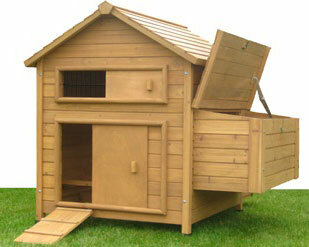 If you have a coop that is 90cm x 90cm, this could house a maximum of 9 medium chickens. Do not include nest boxes in this measurement. This should be the inside floor area. Perches: 4 to 5cm wide perches with rounded edges. At least 40cm long per large fowl and 30cm per medium hen (hybrid size) or bantam. Chickens like to sit down when they sleep and a fairly wide perch helps them balance when sleeping like this. They don’t take all of this perch space as they often huddle together but you do need the extra space to allow for gaps so birds lower in the pecking order can still roost away from other hens. e.g. in our example above three perches across a 90cm wide coop is suitable for (90cm x 3 perches / 30cm) = 9 medium hens or bantams, 6 large fowl. Some large breeds will not roost very high and can damage their legs or feet when jumping down from high perches so low perches 30 cm from the floor or a series of perches gaining in height like a sloping ladder is normally better for these breeds. Nest boxes: should be provided below the height of the perches to ensure birds don’t roost in them and soil them. They should contain straw (not hay due to mould spores that can cause problems) or another suitable nesting material. Aim to provide one nest box for every four hens with a minimum of two nest boxes. See further down the page for more information on perches and nest boxes. The quality of a chicken coop is important. Generally speaking, the more you pay, the better quality you get, especially with wooden hen houses where the wood costs are the main ingredient. Higher quality chicken coops are made of solid, pressure treated 12mm tongue and groove boards that interlock with one another. Remember thin boards can mean weak doors if you are not careful that can be a problem if you have a determined fox. Fittings should ideally be galvanised to stop them rusting. This is very easy to check, even when buying online – you can often tell, just by looking at a manufacturer’s pictures. 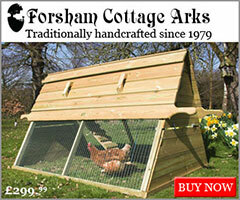 A high quality coop – The Lenham from Forsham Cottage Arks. Click the image to learn more! 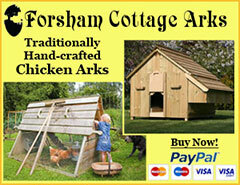 A well known name in the UK is Forsham Cottage Arks. You may even recognise these coops from television shows such as Big Brother (some of the earlier series) and Hugh Fearnley-Whittingstall’s ‘Chicken Out‘ campaign that was on the television a few years ago. The house shown on the right is the famous ‘Lenham‘ – one of these was also presented by the Poultry Club of Great Britain to the late Queen Mother in celebration of her 100th Birthday back in 2000! These houses are made in the UK and are a good quality construction that is built to last. With a little care, these will last a lifetime. 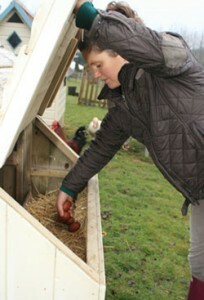 Omlet bought Forsham Cottage Arks in 2011 and now produce these chicken houses. You can see the Lenham and a range of other houses on their website here where there are some better photos and further information. In days gone by, chicken houses were often sold with a felt roof and the main wooden body of the house was treated with Creosote to weatherproof it. Red mite that live in the cracks of houses weren’t really a problem, however since Creosote was replaced with “Creosote Substitute” chicken keepers have been finding their coops full of red mites in the summer months. A well built chicken coop. Good quality timber & fittings, easy access. The roof isn’t ideal having felt tiles which can harbour red mite. So what has this got to do with the roof of the chicken house? Well, felt roofs are all very good until you find the red mite have gone underneath the felt where you can’t get to them and as a result, you cannot get rid of the red mites without removing the felt and starting again. Ideally, you should be looking for a corrugated steel or an onduline roof to prevent this problem occurring. This also has the benefit of providing high level ventilation where the roof meets the wall. Some houses use tongue and groove (interlocking or overlapping) wooden roofs which are normally easy to clean with a hosepipe jet or pressure washer if there is a red mite problem. This is very important – Chickens can withstand the cold and are kept in temperatures as low as -20 in countries such as Canada, however, they need a dry, draft free house to sleep in that is well ventilated. Your coop should have some form of ventilation at high level and some sort of inlet at a lower level. They should not be perched next to an opening as it will be too drafty for them. Chickens droppings release ammonia which needs to be removed from the house by having good ventilation. The heat from the droppings causes this to rise and with a vent at the bottom to bring in fresh air and a vent at the top to allow the ammonia filled air out, all should be fine. Always point ventilation windows away from prevailing winds and close them up if there is wind blowing in through them because on nights like this, there will be sufficient ventilation through the gaps in the wood. The real test is to put your head into the coop in the morning before letting the chickens out to see if you can smell ammonia. If there is too much ammonia in the air, your hens lungs and eyes can be damaged. Chickens are particularly susceptible to respiratory problems but this can also stress your hens and lower their immune systems… which in turn increases the chances of disease being picked up. 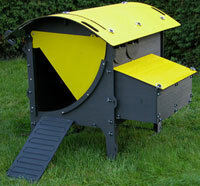 If you buy a chicken house then it should come already fitted out with nest boxes. These are usually added onto the side of wooden chicken houses with a lid to the outside so that you can lift it to collect your eggs. Remember that foxes are quite smart and can usually lift these lids so it is always best to have a latch on the lid that can be secured firmly. Garden sheds or similar can also be adapted to house chickens and nest boxes can be added to the inside of the shed easily as there is usually more room. You can of course build your own nest boxes out of wood (15 inches square is usually a good dimension) and plastic inserts that allow eggs to ‘roll away’ out of the nest can be purchased too. An alternative solution is to buy some ready-made nest boxes. Some of these like the Chickbox are plastic and make it easy to remove red mite which can be a problem with the cracks around wooden boxes. The Chickbox has a roll away plastic tray built in which causes the eggs to roll into a safe area which keeps eggs clean and away from other hens feet when they come in afterwards lay. 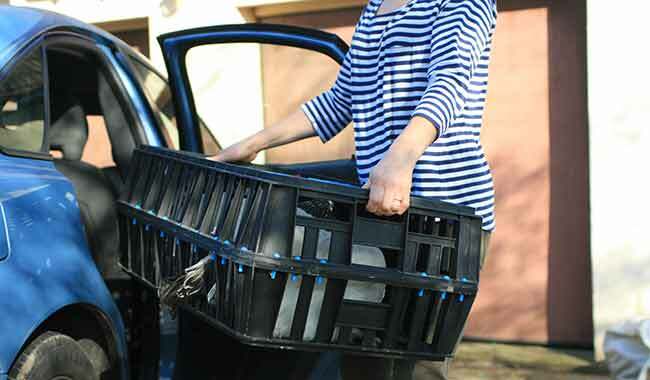 To collect your eggs, you have to lift the landing perch and then lift the little clear plastic lid. The Chickboxes can clip together side by side to form groups of nestboxes if you need more than one. 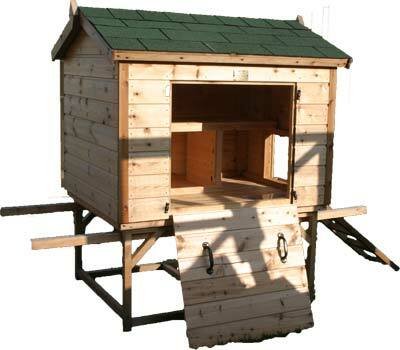 Perches should be sturdy and allow a hen to wrap her toes around the edges. The corners should be smooth to help her do this. The most important thing is they should be higher than the nest boxes are to ensure the hens use the perches at night and not the nest boxes. 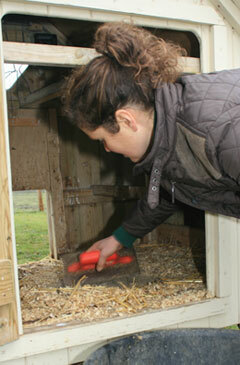 If they use the nest box, it will need cleaning every day – chicken muck where they lay eggs is not good! See “How Much Space?” further up this page for the dimensions. After some use, you will need to wash the chicken house out using a detergent like poultry shield. 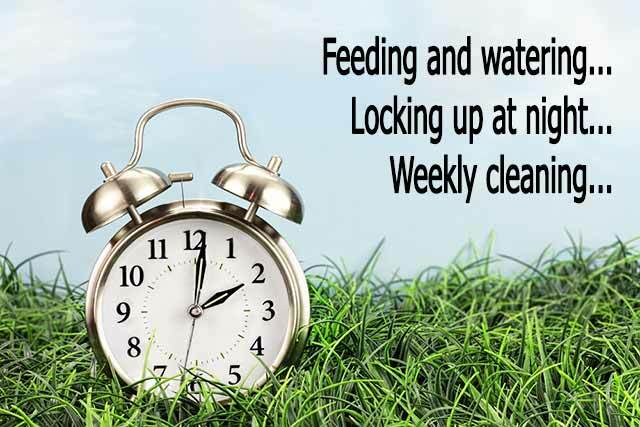 This helps to remove organic matter (or chicken muck) and also helps to keep red mite under control which can be prolific during the warmer summer months (usually between May and October). 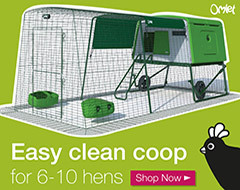 Ideally, you want a coop that has easy access for cleaning and has as many removable parts as possible – droppings boards, perches and nest boxes should all ideally be removable so that you can clean your chickens’ house out more easily. The wood thickness and whether it is pressure treated. There are of course hundreds of suppliers of chicken houses of varying quality. One I would recommend that provides practical, high quality houses is Omlet – they stock the famous plastic chicken coops, but also produce the high quality Forsham Cottage Arks wooden coops and arks. The Forsham Cottage Arks range are hand built in the UK, are practical and will certainly last a lifetime and will have good resale value in many years to come. As I work from home I have an abundance of shredded paper & I was wondering if this could be used as a bedding material instead of straw?? Yes you can, it needs changing regularly because it compacts and it can blow around a bit more but it’s useful to use as bedding material. Hi, I haven’t established whether it is necessary to have grass. We are thinking about putting them on a permanent strip of land – it will probably become bare quite quickly. Is this a problem so long as we can provide them with straw and wood chippings? Grass is good protein for chickens and they will eat a certain amount of it, however it isn’t essential if you’re providing other forms of nutrition through formulated feeds and greens. We are just starting out and getting ready for 4 chickens next month. As they will be ex battery hens, I’ve been told we will need to put them to bed every night as they won’t be used to this. We’d also like them to be free ranging in our garden throughout the day. With all of this in mind, do we need a run or will a hen house be enough? I’m not sure what benefit the run will be, as surely they’ll either be free ranging, or asleep in the house? A run is useful for containing them if there are foxes about – some people keep them in whilst they are out and let them out at other times. If you keep them in their house for a week or so, they will get used to sleeping in there. Once you let them out the first few times, you should go out at dusk and check they find their way back to the house. Some chickens get it straight away, others can take a week or so before they realise where their home is.